Edmonton’s 43rd DemoCamp took place last night at the Centennial Centre for Interdisciplinary Sciences (CCIS) on the University of Alberta campus. It was the final DemoCamp of 2018. You can see my recap of DemoCamp Edmonton 42 here. Xpertz is a Slack app catered toward large teams that lets you showcase your skillset right within Slack. Everything is done using slash commands, and the flagship features include “search by expertise” (so you can find the Android developers in your company, for instance) and “high-five” (which is a way to validate someone’s expertise). Xpertz reminds me a little of the skills on LinkedIn that you can give and receive, but within Slack, and with emoji. Brandon is working on a dashboard with analytics next. Alex, a NAIT student, showed us Digiplay which lets you play PC games right in the browser. He explained that the high cost associated with PC games combined with the new capabilities of WebAssembly make it possible to play games like Tomb Raider and Quake right inside the browser. Currently desktop-only, Alex would like to add mobile in the future, and is looking at licensing games from smaller studios. He’s also got some original games like Foxtrot, which he demoed. The gaming industry seems to be betting on streaming, but Alex thinks the lag and latency associated with that will ultimately prevent it from working effectively. Next up for Digiplay is a custom compiled interface which would add controller support, and taking advantage of streaming compliation once the browsers support it, which would enable larger games. 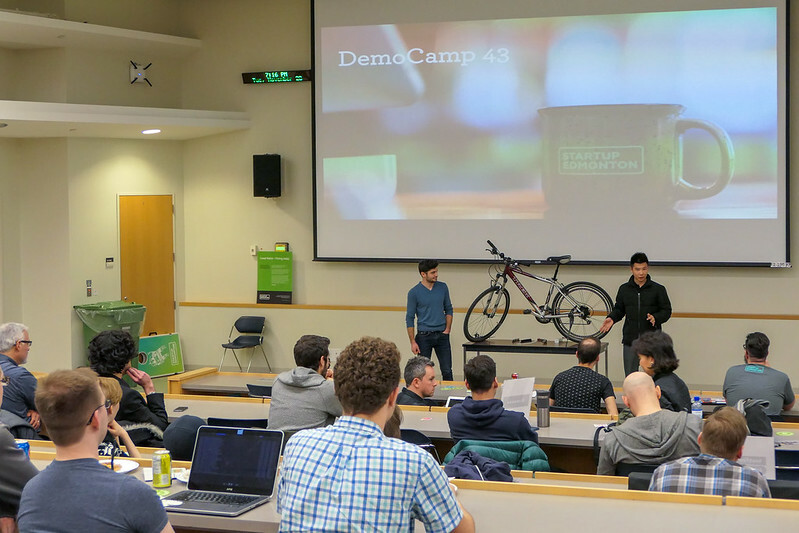 Next up we had two demos from the University of Alberta CompE Club’s HackED Beta hackathon, which took place recently. The first team, made up of five high school students, showed us Habit Creator, which is a fun web app for reinforcing your habits. As you complete habits you earn rewards that allow your environment to level-up, represented visually as a picture of nature (so as you level up, flowers and other foliage appears). The team had to learn everything in 24 hours! Habit Creator includes a progress report to show a day-by-day breakdown, but currently uses browser storage. 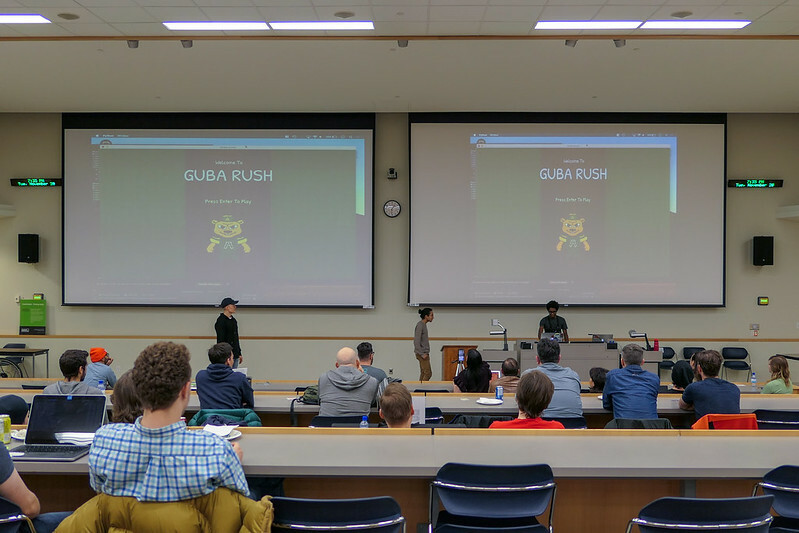 The second team showed us Guba Rush which is an interactive, motion-sensing game featuring the University of Alberta team mascot. One of the team members wore a vest and fanny pack that contained accelerometers, gyros, and an Arduino. As he moved, the data was transmitted to the game to control the character on-screen. The idea is to physically move in order to dodge or jump over obstacles on the screen. Think of it like a Kinect, but with a vest you have to wear. The final demo of the night was from Dan who showed us HonestDoor. He realized when buying real estate that greater transparency would be helpful, so he started tinkering with HonestDoor and realized others found it useful too. The web app can show you the last sold date and price for a given property, and in some cases can also provide an analysis of what HonestDoor thinks it might be worth. The data comes from third parties, including land titles, but was fairly incomplete in the demo. There’s clearly demand for this type of app, given the popularity of Zillow south of the border. See you at DemoCamp Edmonton 44!